A while back, when SuperData reports were less widely accepted than they are now, you speculated about how they obtained their information. I think you said that one key source would be the companies themselves feeding the numbers to SuperData because they wanted to be included. I wonder if the reverse is also true? Perhaps, when it wouldn’t look so good to see the games sliding down the charts and falling off the bottom, that information feed might get throttled back or switched off entirely? Perhaps Blizzard is keeping WoW’s numbers to itself these days? This post and its numbers really hammer home how terrible the data they collect is. I mean in the past you could at least look at the trend of the data, and assuming they didn’t butcher it month-to-month, it was something. Not ‘good’, but something. But now with this? Sorry but its now 99% garbage, on both an individual level (Fortnite is as likely to have made the reported 2b as it is 1b or 5b) and in overall trending (like you point out, not including some of the known biggest titles makes it hard to take anything else seriously). I can still buy vinyl records and bicycles, when clearly there are more “profitable on volume” options present for manufacturers. It’s when you go to a hipster convention to show off your new xtra super duty truck that the entire thing goes off the rails. Still, it does reinforce the point that a company primarily motivated by profits will focus on the most profitable ventures. The idea of Blizzard being a “make good games for gamers” company died in 2018, and folks are having a hard time letting that one go. I do take notice on Monster Hunter, which has so few microtransactions, and RDR2 which didn’t have a cash stop until only a few weeks ago. Holy moley they shipped a lot of “boxes”. @Bhagpuss – As part of the report intro they briefly cover where they get their data, and directly from companies is on the list. As I have said in the past, there is a big incentive for public companies to be included in coverage by analysts. Likewise, any company that would like to go public needs to get some attention on that front, and that means sharing data. The flip side is that those companies need to be careful with the data they provide. Public companies lying about numbers to an analyst can get them sued. But they can withhold data whenever they want, or slice it up if they think it is beneficial. I believe we saw the latter when WoW was split into East and West on the charts for a couple of months in 2017. @SynCaine – Bloomberg was calling Fortnite revenue at more than $2 billion on its own data back in December, so I am not quite ready to call it garbage. 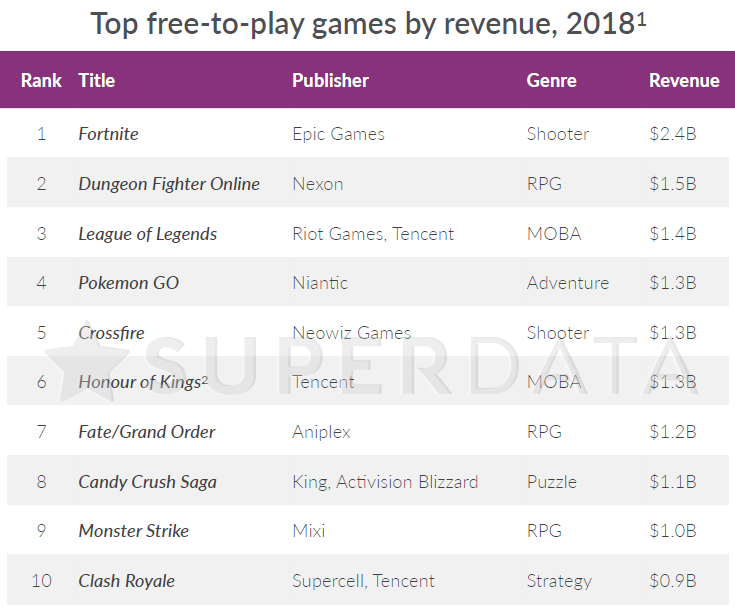 And, like Riot, Epic is owned by Tencent, so both LoL and Fortnite numbers are likely from the same source. This report, like the monthly reports, are a tease. 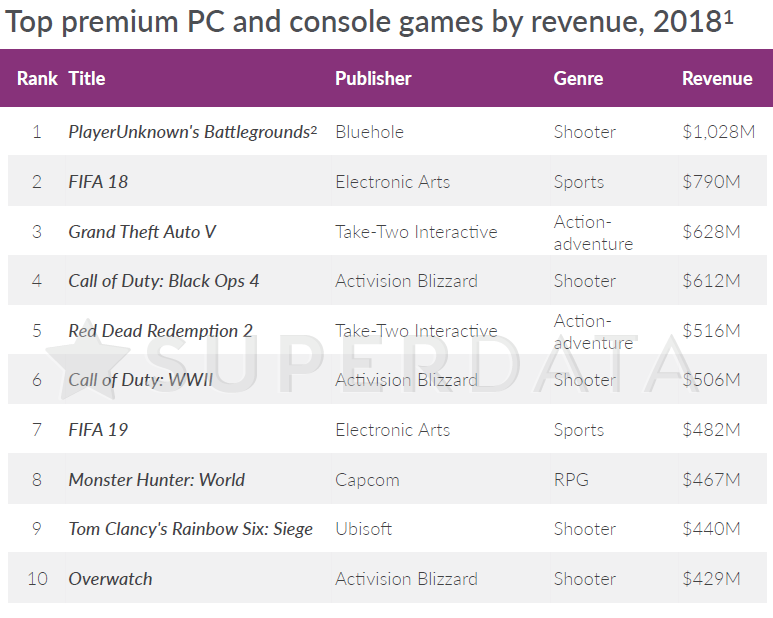 That they lumped mobile, PC, and console free to play into one chart hides some data, but doesn’t make it invalid. You can find out how good or garbage any bit of data on this report is if you’re willing to spend the money on the reports or their service option. That they’re still in business, and deemed valuable enough to be scooped up by Nielsen argues against the 99% garbage theory. And, in the end, the bigger trends are still visible whether you like the line item numbers of not. Mobile rules, especially in Asia, while free to play and cash shops and lock boxes pay a lot of bills. Old school buy the box and subscription models are there, but aren’t selling like they used to. WoW is tanking, but I find it difficult to believe it’s tanking that badly. Even 3 million subs is $540 million a year. “Pay to Play” is likely where it resides, as you note. Given how tiny of a percentage P2P is of the overall market – and the possibly related truth that very few games are viable with that model – it makes sense that SuperData would drop everyone in that category off the sheet. Who would pay for that information, when 71% of the entire market is at least 4x more profitable? Fortnite reigns supreme at the moment but that is mostly the young teens and sub 12 year old market. Every single friend of mine that has kids are all playing Fortnite and if their not playing it then they are all talking about it. Plus most of them have bought items in the cash shop with their parents permission. Fortnite is the new Cabbage Patch doll for this current young generation. But it is a fickle market and kids interests change very quickly so we will see how long it can sustain its success. The Nielson buyout always looked to me like an outdated company that is losing relevance grasping at something to stay alive, and in that grasp doing something pretty foolish. I don’t see that as suddenly Superdata become a ‘verified’ source of true information, especially not when for so long, they are putting out charts that we know are incorrect and/or incomplete. Even doing a cross-reference between the Steam data leak (which we know was 100% accurate since it was a leak) vs what SuperCell has been reporting will show how highly flawed it was. @ Asmiroth- And MH is the game that gives out regular, free DLC of good quality, too.